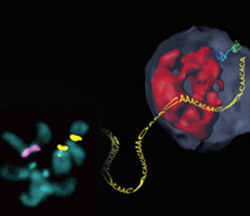 Irene Chiolo of the University of Southern California and Gary Karpen of the University of California, Berkeley, and the Lawrence Berkeley National Laboratory were part of a team that learned that healthy fruit fly cells mend breaks in heterochromatin by moving the damaged DNA strands to the inner wall of the nuclear envelope. There, proteins embedded in the envelope make the necessary repairs in a safe place where the broken DNA can’t accidentally get fused to the wrong chromosome. This process is critical, because faulty heterochromatin repair can cause widespread genome rearrangements and genomic instability, potentially leading to the development of disease. 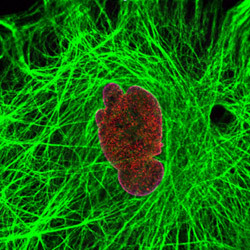 The ER (stained green throughout the image) wraps around organelles (magenta and red clusters) in a monkey cell. Credit: Melissa Phillips, University of Colorado Boulder. The endoplasmic reticulum (ER) includes the rough ER, which contains ribosomes that produce proteins, and the smooth ER, which neutralizes toxins and produces major components of biological membranes. The ER has been depicted in textbooks as a series of interconnected tubes and flattened sacs tucked neatly near the outside of the nucleus. But Gia Voeltz of the University of Colorado Boulder and her research team found that the ER doesn’t stay put in this one spot. The scientists marked the ER with a green fluorescent protein that enabled them to watch the ER wrap around other cellular organelles as it spreads out from the edge of the nucleus to nearly every corner of the cell. The team is now exploring how the ER may be interacting with these other cellular structures. They’ve already found that the ER plays a role in the division of cellular compartments called endosomes as well as in the division of the cell’s powerhouses known as mitochondria. 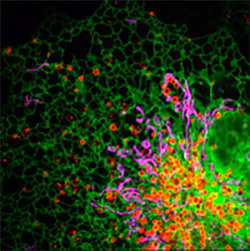 A network of fibrous cytoplasmic filaments surround a cell’s nucleus. Credit: Robert Goldman, Northwestern University. The cytoplasm, which holds all of the cell’s contents between the edge of the nucleus and the cell membrane, was long thought to be a gel-like fluid filled with organelles and proteins bumping into one another and drifting about at random. But that view is changing. A multi-institution research team headed by Robert Goldman of Northwestern University is studying the fibrous filaments that give structure to the cytoplasm. Using a laser tool known as an optical tweezer, the scientists measured the forces generated within the cytoplasm. The measurements enabled the scientists to build mathematical models suggesting that molecular motors in the cytoplasm create waves. Collectively, the waves generate the forces needed for the seemingly random movements to occur in the cytoplasm. The researchers believe the waves also may help distribute enzymes and other important molecules throughout the cell. I wonder if the movement of ER rearranges actin networks. Or is the ER just squeezing into different spaces?